It doesn’t take long for users to decide whether they like your app or not. According to this study, 35% of mobile app engagements last less than a minute. But that’s not the end of it. 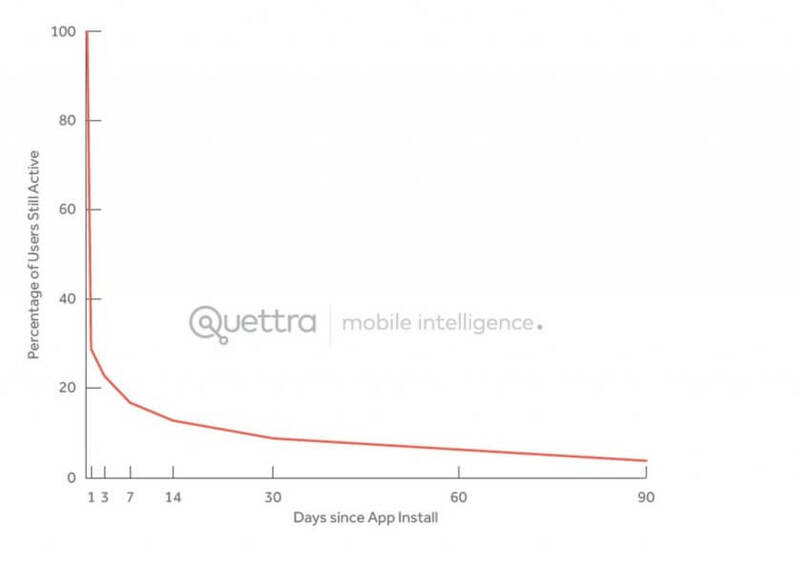 Another survey showed that 77% of users never use an app again 72 hours after installing it. Take Google Wave as an example. It was supposed to be the ultimate communication tool and a solution to the annoying group emails. But that wasn’t enough to ensure its success. Nobody really understood what Wave was about. Google never bothered to deliver a real value proposition to its customers. Moreover, the end product was hard to use and simply didn’t meet the expectations of its target. Needless to say, it was pulled half a year after its launch. We can learn a lot from stories like that. Here are 8 reasons why apps fail, even if they promise to solve the most pressing problems of their targets. A great idea is just theory. It doesn’t guarantee a great app in practice. That’s why the decision to launch the development project should be driven by research. And heaps of it. You don’t want to develop and release an app nobody wants or needs. Check whether there exists a market for the app. Does your app solve a particular problem? Are there any competing apps that deal with a similar issue? Will you make someone’s life easier with your app? Research the potential audience for your app too. You need to know your target like the back of your hand. Once you understand how your audience consumes apps, you’ll be able to judge whether your idea is mature enough to make a fantastic app. A great user experience relies on many components. First, you need to ensure that your app is intuitive to use. You simply can’t have a user struggling to perform the easiest functions of your app or to understand its core functionalities. Poor usability will be the death of your app. What’s more, when refining your idea for an app, take into account the length of the registration process and accessibility of different features. It really makes a difference. Follow the best UX practices to avoid mistakes that might cost you a lot. You need to know everything from the minimal sizing for tappable controls or swipe gestures that differ across platforms. Check 6 essential mobile app design tips. This means that the app is designed with only one device type or OS in mind. An app needs to work smoothly in all its variants. If your app performs great on iOS, but lags on Android, prepare for trouble. Users might quickly become frustrated with the app and cause it to fail in that particular segment. Ensuring maximum app performance is also about creating a familiar user interface. When designing your app, pay attention to the expectations of users. The actions they take need to be consistent and familiar with other apps available for the platform. Launching a bug-free app is next to impossible. But it doesn’t mean that you shouldn’t do everything you can to ensure that users encounter no major problems upon the first use. That’s why you should test your app diligently. Only then you can be sure that it’s free of bugs that can easily ruin the user experience or cause the app to crash. You can only imagine the number of users who decide to try the app once more. You guessed right, it’s very low. You’re not likely to get a second chance, so make a great first impression on users or face failure. Why testing is so important? Check out. If you think that developing an app is about designing it, marketing it, getting customers, and making a fortune, you’re making a huge mistake. Even if you ace your app design and marketing, you still need a smart monetization strategy. Without it, your app will never bring you a profit. And that’s not uncommon. Gartner predicts that by 2018, only 0.01% of mobile apps will be considered financially successful. How do apps make money? You can charge users for downloading the app or generate profit from in-app ads or purchases. Head over here to learn more about these monetization schemes and decide which one is right for you. You need to pay close attention to these two factors. Bad design and poor execution can cause even the most amazing app idea to fail instantly. If an app is unpleasant to use and the design looks simply bad or outdated, you shouldn’t be surprised that users uninstall it from their devices. When designing your app, remember to create a user-friendly interface. Include images of high resolution. Offer a great user experience with carefully placed features and buttons. Do your best to employ a talented designer who will create a unique user experience for your target. Be ready for changes. No app idea is versatile enough to suit all consumer groups at all times. And the mobile market is very dynamic. It’s changing constantly, and so should your product. As trends come and go, customer requirements and expectations change as well. You need to quickly respond to these changes and make decisions that take your app to the next level. Your app needs to be scalable, but also flexible enough to be adaptive. A bad marketing strategy – or no marketing strategy altogether – can easily kill an app idea. There are many ways in which you can promote your app. Once you understand your target audience, you’ll know which channels will help you to attract its attention and engage it with your product. Marketing takes up a lot of resources. But investing in it is crucial for the survival of your app on an overcrowded market. There are a lot of reasons why apps fail. But with our tips in mind, you should be able to take proper measures to ensure that your app never falls victim to these problems. That’s how you do justice to the great idea that powers your app.